This is a very silly little once upon a time, that I cherish for the coincidences, the improbable attachments, the happy recollections, the bittersweet reminders. Once upon a time, we were in Boston, and it seemed there was nothing that did not delight and enchant me. 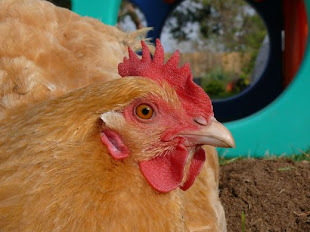 Jennifer was our guide, and we were seeing marvelous sights, touching history, meeting the scenes of storybook pages. It cannot surprise you that I was trying to take pictures of everything... the man on the curb painting, each maple leaf, and sun dappled surface, walls, streets, the air and light. There wasn't anything that wasn't captivating to me, that I didn't want to carry home, revisit. The city was busy. It seemed like everyone was out to soak up the fleeting warmth of sun and the color of an ideal fall day. We walked through the Public Park, across Boston Common, we strolled row by row through the Granary. 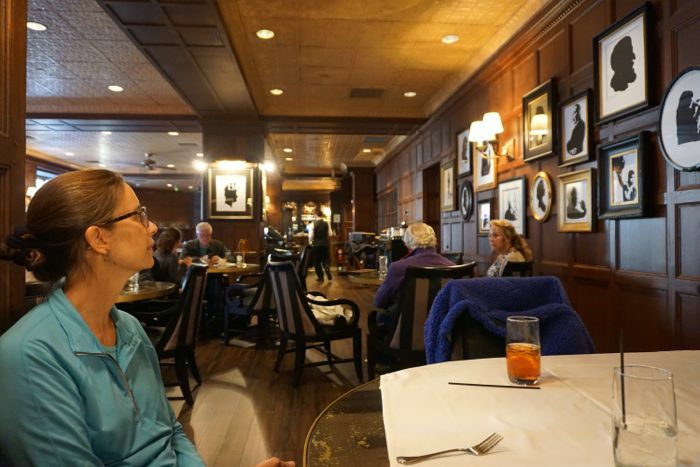 And then Jennifer led us to The Parker House. It was a kind of perfection... the kind that is warm, rich with history, a gentle mood, quiet, refined. I ordered the clam chowder. Is that just too cliche? I will not apologize. Boston. Clam Chowder. However much, or little, I know about New England, about Boston and Massachusetts, about a cold autumn day exploring an old city on an Atlantic Harbor... I knew I was going to have a bowl of clam chowder, sooner or later, without fail. And this seemed the time to enjoy that experience. The soup was delicious. The crackers... the cellophane packet of Westminster Bakers Co. Oyster Crackers were delicious. New England Original, Naturally Good. I savored each little, crisp puff, reveling in the curious way the button sized crackers have a natural line that cleaves open, like a cap popping off a teeny box. Are they bland? Well, yes, I could say their flavor is not strong or distinct, but that is not to say they are dull. To say something is tasteless is to miss their subtlety, to disregard the distinction of enjoying a simple flavor, a modest pleasure. Like then, I feel peculiar for the regard and thought I gave to oyster crackers. I felt, though entirely sincere, that my eager affection for the crackers, for every leaf and acorn, for expressway signs that read "New York," "Rhode Island," "Nantucket," was effusive. Wholehearted and heartfelt though my impressions can be, I sense that lavish praise, aggressively friendly gestures, are sometimes a weakness of mine. I distinctly remember curbing my impulse to take a picture of the the cellophane packet of Westminster Bakers Co. Oyster Crackers. I did sneak a self-aware and hasty picture of the chowder, but it's out of focus... I was probably shaking a bit from giddiness. One year later... Jennifer sent us a care package, full of New England, thoughtful reminders of our visit. It was like revisiting our adventures, our time together, our friendship. And here you see Mister Foo, who, so cat-like, plopped himself down on the gifts and goodies, nestled onto the bag of stoneground corn from the Plimoth Grist Mill, made himself cozy on the felt leaves. And between his paws, what do you think? Jennifer, kindred spirit, sent me a cellophane packet of Westminster Bakers Co. Oyster Crackers, those crisp puffs. I teared up... not because oyster crackers make me emotional, but because Jennifer knows me, remembers details, appreciates even seemingly little things, and she lets them matter, shows she cares. For some silly cat reason, Foo wanted to be in the midst of all this sentiment and attention, and he wanted to hold my crackers. I took his picture. I shared it on Instagram, and in my own bemused fashion I even: #westminsterbakersco. 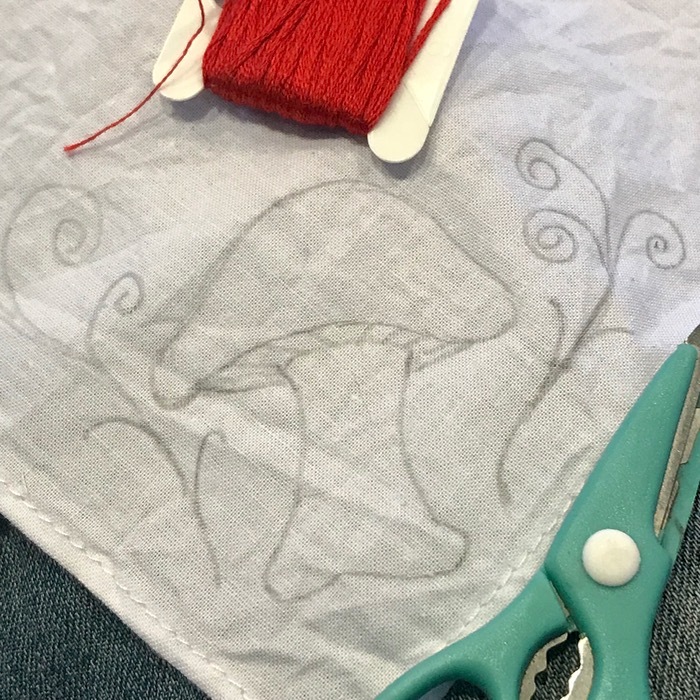 One month later, one day after realizing our losses, reeling from the newness of grief, I sat with a bit of sewing to do while waiting out a long appointment. It was late in the afternoon. 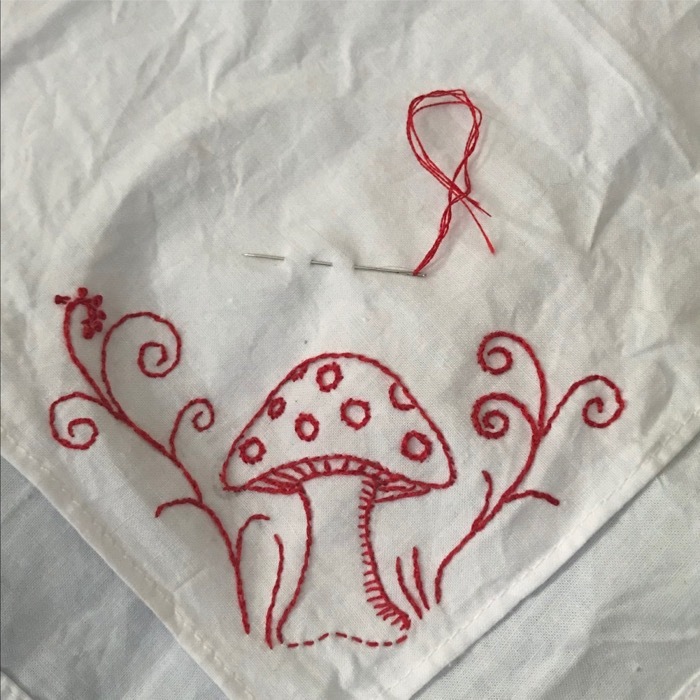 While I stitched, I thought about Foo, about Grandmother, about untangling strands of red floss, about what to make for dinner. I was hungry. I'd only had one thing to eat that day... earlier, when putting things away, I came across the oyster crackers. I was saving them, for a special occasion. I ate them, then and there, reasoning that the thoughtfulness of my friend was just the kind of special I needed. And, yes... I cried, then, too. 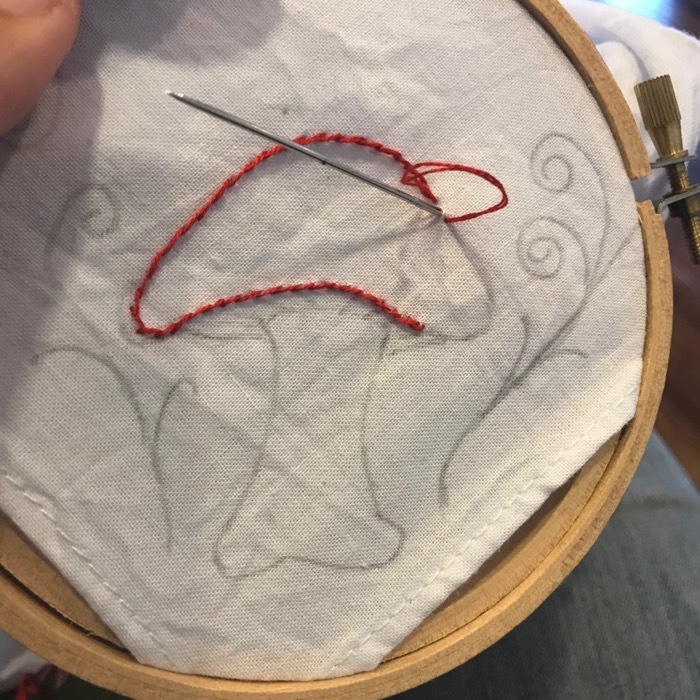 I missed my friend, my cat, my Grandmother, and I missed being away on an adventure, feeling hopeful about the world, and excited for our beautiful New England days. The crackers, simple things, were like a taste and reminder of all of those ideas and memories, and sentiments. I was in a hurry, running late, I folded the cellophane bag, and crammed it down my back pocket. 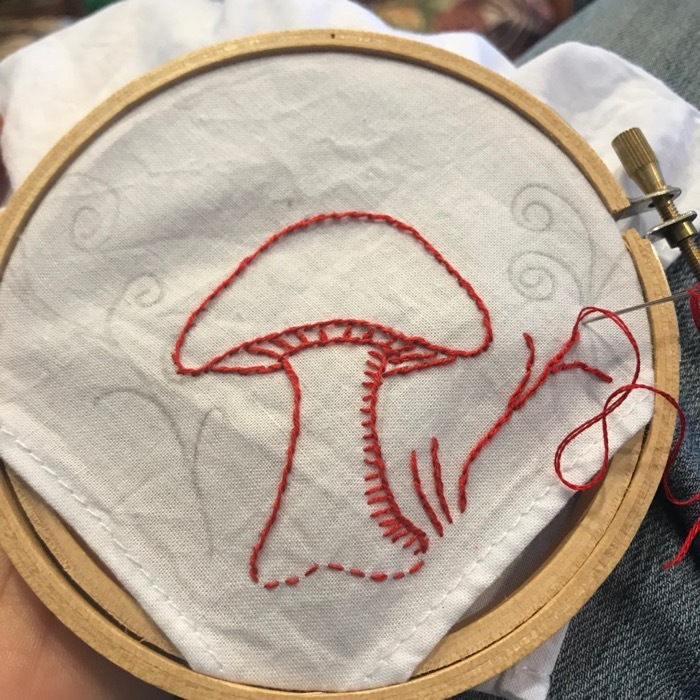 I posted a picture of my redwork mushroom in progress on Instagram. 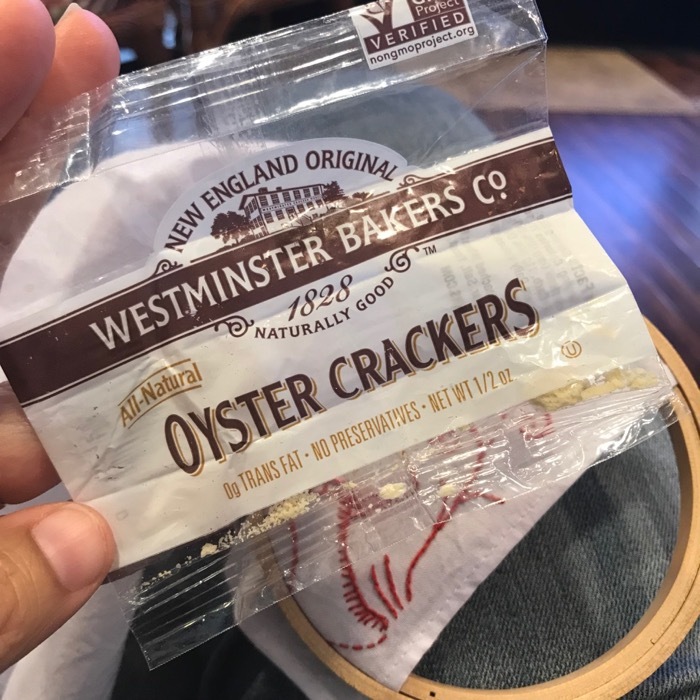 And then I saw a "Like" for an old post, and I saw it was the Westminster Bakers Co., liking the picture I had posted of Mister Foo, with his arms around the oyster crackers. 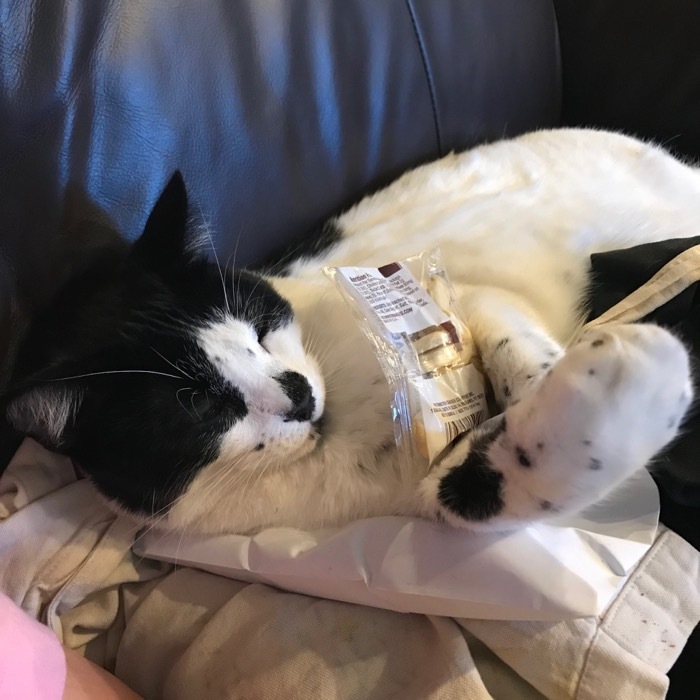 It was a month ago that I shared the moment... and to the day, a month later, they were reminding me of Foo, of our dear kitty, of Jennifer's care package, and the very same crackers that I'd waited to finally savor, and had finally eaten, this day. I reached into my back pocket, pulled up the empty wrapper, and thought... what is that word, when something is more then mere coincidence? Synchronicity. I know... it's a simple story, told with elaborate, effusive detail, and maybe it is only happenstance. Random events, read with an active imagination, and a penchant for fancy, but that's like calling a cracker bland, missing the nuance and pleasures of something worthwhile, something serendipitous, fanciful, dear, puzzling or inspiring. 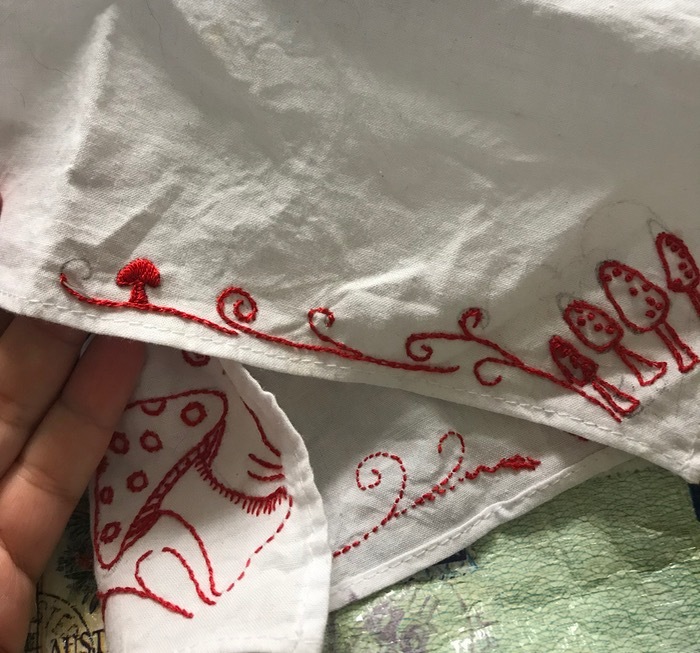 I cannot help myself... noticing details, lavishing admiration for simple things, offering aggressively friendly gestures, are sometimes a weakness of mine. At times, I manage to curb my impulses, and at other times I write the story down, and share, here.